When you file a personal injury lawsuit, you are seeking monetary damages for some harm that another party has caused you. These damages maybe awarded by a court judgment, although in practice most cases are concluded with a settlement before going to trial. When you file a lawsuit and receive a settlement, then the defendant pays you some amount of money in exchange for your (and your attorney’s) promise to not pursue further legal action. In most cases, a settlement is a satisfactory way of ending a personal injury case quickly, without the stress of a potentially lengthy trial. But did you know that there are different types of settlements? If you settle a lawsuit, you will encounter one or the other of these, and in this article, we will tell you how they work. A lump sum settlement is the most basic kind of settlement, and most payments in personal injury cases take this form. As the name suggests, it involves the defendant in the personal injury case paying you (the plaintiff) a single sum of money, which constitutes the entire settlement. Lump sum settlements are beneficial in that they settle the matter at once. You get all your money without having to wait. As you might guess, though, a lump sum settlement can be quite burdensome on the party paying it, because it may be more than they can pay at once. In a structured settlement, the defendant agrees to pay you in a series of payments; this is known as an annuity plan. The payments may continue for several years, or even the rest of your life. The precise arrangement of a structured settlement, i.e., the amounts of payments, and how often the payments occur, will vary from case to case. Some structured settlements will involve payments which increase over time to keep pace with inflation. Others will involve payments which decrease over time, if, for instance, a person’s medical bills are also projected to decrease. 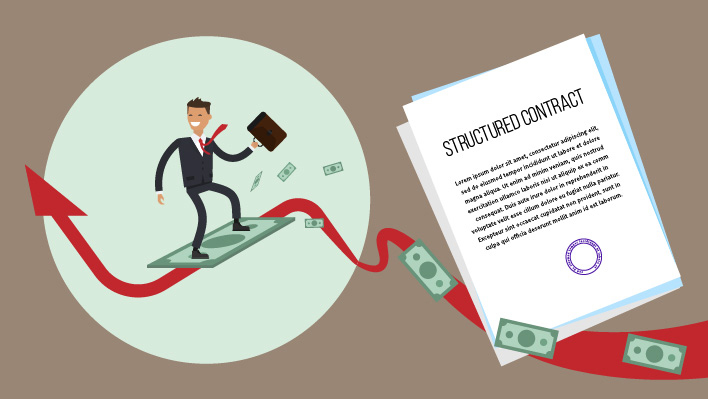 Some structured settlements also include a lump sum payment which is larger than the others, either at the beginning (i.e., immediately after the case) or at the end (once the other payments have been fulfilled). Some structured settlements may have periodic lump sums that occur at certain intervals within a schedule of smaller monthly payments. You and your attorneys will work out the details of the structured settlement, but depending on the precise nature of your case or your injuries, there are a variety of ways in which things can be made to work for you. Structured settlements are less common than lump sum payments, and it’s not very hard to see why. If you have been in an injury, you likely want to recover your damages as soon as possible, and so having your money trickle in over a long period of time might be frustrating. But structured settlements do have a variety of advantages. Perhaps you’ve heard the stories about people who win the lottery and blow through their money in only a few years. Similarly, many people who receive such a lump sum settlement experience this phenomenon, called “mental accounting,” and spend all the money on unnecessary items, purchase items that require expensive upkeep (such as larger homes or high-performance vehicles), or make poor investment choices. We’ve seen this happen several times in our practice; a structured settlement can protect against this. A structured settlement also has certain tax advantages. The longer you leave your settlement money in the bank, the more taxes you will have to pay, because the interest you’re earning on your settlement is taxable, even though the settlement itself is usually not. However, a structured settlement also comes with some potential disadvantages as well. If the party paying you the structured settlement goes bankrupt before paying you everything you are owed, you would lose a large portion of that money. If your injuries are serious and you are deeply in debt, as happens quite often in personal injury cases, you may need the money immediately. Which Settlement Will Work Best For You? Each case is different, which is why options exist. Your attorney can help you examine your circumstances and review all the options to create a settlement solution that is right for you. At TorkLaw, our attorneys are experienced at assisting clients with settlement decisions. Call us at 888.845.9696 for a FREE consultation.